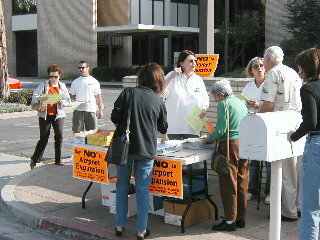 (October 12, 2003) -- Roughly 100 people turned out on Saturday morning Oct. 11 -- not by city advertising but via the grassroots Airport monitoring group LBHUSH2 and local activists -- for a meeting City Hall was mandated to hold to gather public input on issues that should be addressed in an Environmental Impact Report (EIR) on permanent expansion of LB Airport's terminal area facilities. ...where in a corner at rear of the auditorium sat a court reporter (stenographer) to take down one's thoughts. Attendees were also given the choice of sending in their comments on a postcard, or emailing them later...which would have equal weight. The bottom line: no microphone for the public -- whose input was the reason for the meeting -- effectively preventing those attending from hearing what others said. After learning of the format about ten days earlier, LBHUSH2 president Rae Gabelich objected and urged City Hall to return the common mike/podium format for public input. An exchange of email ensued, after which city staff agreed to revert to the conventional mike/podium format for the Oct 16 Thursday night scoping meeting...but wouldn't budge on the Oct 11 Saturday morning meeting. "This meeting format...undercuts one of the key benefits of a scoping meeting, the ability to listen and learn from other members of the community...Your statements may be reduced to speaking quietly to a stenographer!" 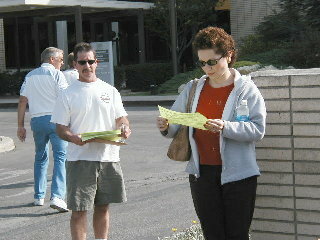 Other LBHUSH2 members (photo right, Mike Kowal) used the opportunity to invite attendees to get on the group's email list. The meeting began quietly, but eventually -- like a pressure cooker over boiling water -- the lid blew off. Audience displeasure reached the point where staff agreed to change the format on the spot, invited the court reporter to the front of the room, gave the public access to the microphone...and listened to what people had to say. 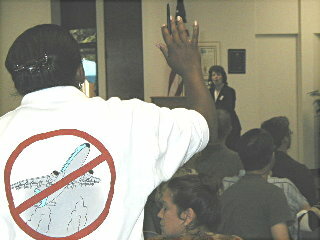 In addition to noise issues, a number of audience members asked for an evaluation of the impacts of airport related pollution. Some said they wanted to see a health risk assessment. And some asked for evaluation of the presence of methane gas under or nearby the Airport. 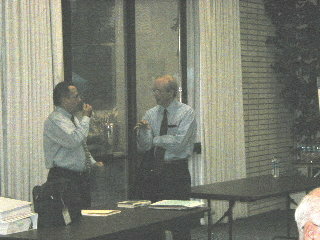 Among those observing the proceedings were 4th district Councilman Dennis Carroll (seen here with Airport noise consultant Vince Mestre; our apologies for the poor picture quality shot from across the room). 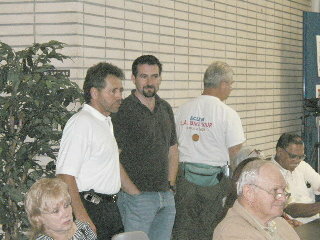 2d district Councilman Dan Baker alongside ELB realtor Joe Sopo. Also attending but not pictured, 7th district Councilwoman Tonia Reyes-Uranga and Tim Patton, an aide to 5th district Councilwoman Jackie Kell. Ms. Gabelich was the first to speak out from the floor after a presenter advised: "We're just basically taking input at this point as to what the EIR should be. This is not really a time for the merits of the project, there'll be plenty of opportunity for that in front of the City Council." Ms. Gabelich said, "Excuse me. Is it not true that if we do not speak up at these scoping sessions, that it will not be included into the administrative record so that if there's litigation, our complaints cannot be heard unless they've been voiced here?" "Actually no, that's more at the hearings on the EIR, once the draft EIR is out," said the presenter, adding "but that is true for once that draft EIR is out, that they can comment on the document, but not really at the scoping meetings." Ms. Gabelich said, "I would suggest that everybody be very sure they put their comments in writing and submit them before Oct. 22...because I was advised by [our] attorney that what is done during the scoping meetings [your comments] will be added to the record." The presenter replied, "There'll be plenty of opportunities. We do have a court reporter trying to make a transcript of this, so we would like to limit the number of questions so that she can do her job effectively." This produced audible audience displeasure...and within a few minutes, more comments flew from the floor. These included (among others) Los Cerritos/Bixby Knolls realtor and LBHUSH2 activist Mike Kowal, Stearns Park Neighborhood Association president Traci Wilson-Kleekamp, Linda Sopo (wife of ELB realtor Joe Sopo)...and Los Altos resident Patrick O'Donnell, a candidate for the 4th district City Council seat currently held by incumbent Dennis Carroll. "That's not the issue. The issue is if you build a larger terminal, you're inviting more flights. You're inviting the FAA come in and remove our local control. A larger terminal equals more flights, equals more noise." "It is important to remember that the number of flights at our airport is determined exclusively by our noise ordinance and measured flight noise...Be assured I am closely watching this project [replacement of two temporary buildings with permanent ones, 5,800 sq. ft of add'l passenger holding area and an enlarged parking structure] and will oppose anything that may adversely impact Los Altos, her families, and businesses." LBReport.com posts the letter in its entirety. To view it, click Councilman Carroll Oct 11/03 letter re Airport EIR & LB Noise Ordinance. "I think that's a valid comment. And you need to put that in writing for us and we'll respond." That prompted audience displeasure, including a response from 4th district homeowner Traci Wilson-Kleekamp. "I just want to say I have never been to a public meeting where no one can make public comments," Ms. Wilson-Kleekamp said. Ms. Gabelich then asked bluntly, "Mr. Christoffels, why did you not notice this in a paper? Why did you not send the community notice...Look what we have here, a hundred people that had to find it through our fliers. Why did you not notice the community about something so serious? I'd like an answer to that." 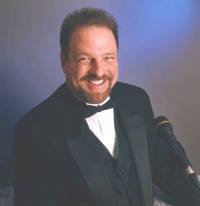 Mr. Christoffels replied, "I'll be more than happy to speak with you later about it" which prompted more audience displeasure. 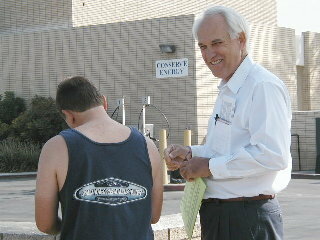 Surfrider Foundation's Gordon LaBedz rose and said, "This isn't a scoping session. A scoping session is where the public [can be heard]...This is a dog and pony show. I'm leaving..." and marched out of the room. Later in the meeting, Don May of CA Earth Corps (a veteran of numerous CEQA proceedings) objected to the process and walked out. 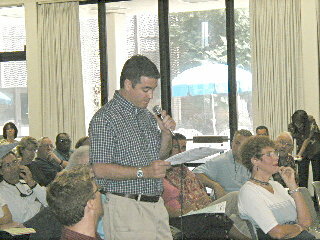 Realtor Mike Kowal then rose and said, "We've been listening for years and years. [audience shouts, "that's right"] It's time that somebody stands up and represents the communities that are airport impacted. This is very dangerous stuff we're talking about. We're going to kill our kids thank you very much...[W]e're tired of all of this." 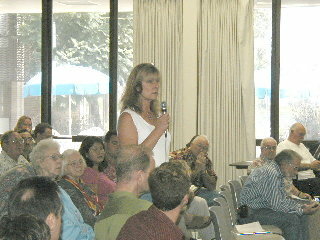 Ms. Wilson-Kleekamp noted that the presenters had said the new parking structure would provide roughly 4,800 parking spaces, while the current parking structure plus outlying lots provided a little more than 4,700 (which invited the conclusion that the new parking structure simply replaces current spaces under the plan.) She asked how big the current parking structure is without the outlying parking spaces...inviting the inference that a new larger structure could be combined with outlying lots to accommodate even more cars. No one could give her a precise answer. "You come to a meeting and you don't know how many existing parking spaces are there. And we paid you guys money! I'm mad! Why did you come here if you don't have all the information? That is crazy!" And we'll be up front with you. We don't have those answers yet. They're very complicated questions. You've asked questions about health, you've asked questions about air quality. What we're hearing today is those are the items that are of concern to the community and that's what you want this Environmental Impact Report to look at. That's what we needed to hear today. We're going to focus our efforts into those areas. The purpose of today was to know what do you want us specifically to look at. Yes, we've heard it before but we're obligated to go out into the community and ask them again, and that's what we're hearing today. 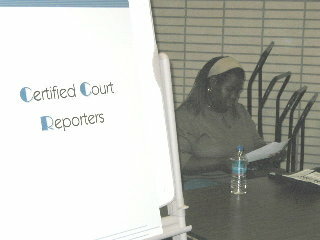 An audience member noted that the court reporter was seated in the back of the room, while "every place I've ever seen a court reporter, they're in the front of the room. She's been sitting back there saying, 'I can't hear. I can't hear.' And I want to make sure we get that on the record." 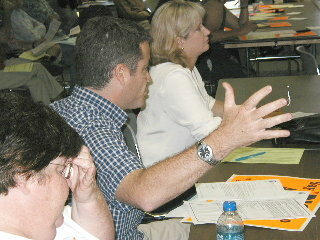 Ms. Gabelich then returned to her question to Mr. Christoffels: "Why did you do this, divide and conquer the community? Why did you not advertise the meeting to the community?" Mr. Christoffels replied, "It's apparent to me that we did not advertise as well as we should. [audience: at all! ]...As I acknowledged, maybe we failed to pitch in on the advertising, but we'd like to work with you [in the future (audibility difficult)]. And Mr. Christoffels invited the court reporter to come to the front of the room...to audience applause. ...Since you folks don't like that approach, we're willing to change it for you. And with that, the meeting's format reverted to a standard "public speaker given the microphone" for a short presentation. Speakers lined up to be heard. Things went smoothely...albeit with often passionate comments. We provide some excerpts below. They are unofficial, prepared by us. Not all speakers or their comments are reflected; bracketed material is by us for clarity; ellipses indicate deletions. Presenter: Our existing scope does not [consider it] because the physical changes are at the terminal. Mr. Christoffels: And to answer your question, that's why we're here. We want to know what's outside of the current scope that you would like looked at. [introduced to applause]...Most importantly is a human health risk assessment...They cannot use the studies that were done back in the 80s. Since that time, diesel particulate matter has been considered a toxic substance. That was not defined as a toxic substance until 1998. 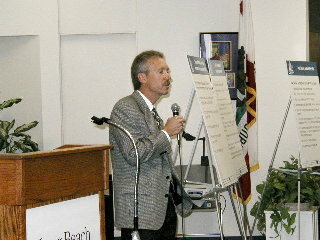 I am here representing my community [Huntington Beach Hope View community]...41 flights, and 25 commuter flights, carrying 1 million passengers makes a different environmental impact to my neighborhood than carrying 3.8 million passengers, and therefore that's the reason that I'm motivated to come trying to have by voice heard in this impact study. We request that the EIR include an assessment of the impact to our children due to the recent dramatic increases in LGB air traffic activity and the regular noise violations which are occurring. In particular, we request that the EIR include an assessment of the long-term health issues and classroom disruption impacts to our children that are caused by the LGB air traffic. We request that the EIR include a human health risk assessment, specifically to address noise and air traffic pollution impacts to our neighborhood. Hope View Elementary School, recognized as a California Distinguished School in 1998 and 2002, is located directly beneath the current approach corridor for LGB runway 30/12. Note that these distinctions were earned during years having 63% fewer air traffic noise disruptions and associated air pollution impacts than current levels due to LGB overflights. Many studies have indicated that aircraft noise is disruptive to children�s development and education, and that fine particulate air pollution, such as lead-based aviation fuel emissions, is particularly harmful to children. We request that these issues be investigated to ensure that we do not jeopardize our children�s health and future. Hope View Park, with a soccer field scheduled for daily use by local children�s soccer leagues, is located directly beneath the current approach corridor for LGB runway 30/12. Studies have shown that children engaging in outdoor exercise are more vulnerable to air pollutants, and so again, we request that the air traffic impact be addressed. ...It would be irresponsible to allow airport expansion in order to accommodate air traffic that is already adversely affecting our children�s health, development and education. It would be irresponsible to allow airport expansion to accommodate air traffic that is significantly impacting our community's quality of life and property values..."
...What is the rationale for not including a health risk assessment in your scope of work? Presenter: The scope of the work we prepared was looking at the project which is building of the improvements at the Airport. It does not address the operations that are currently in effect there and so a health risk assessment would not be needed based the construction of the terminal facilities, and that was the logic behind that. Mr. Howar: ...As has been pointed out before, the '86 EIR, which was the last document that I'm aware of that dealt with issues, did not contemplate 3.8 million passengers a day, and the assumption I would make is that the aircraft back then were smaller, would have fewer impacts, less emissions, and so I think that assumption is probably not a good one. [After identifying himself as a Los Altos resident]...Good to see some of my neighbors out here standing with me on this airport issue, trying to work to control the growth at the Airport. 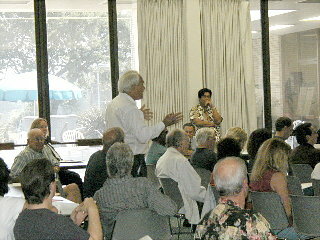 One speaker said LB Airport's current facilities are running at 300% of capacity and can accommodate over three million annual passengers...leading him to wonder how many passengers the proposed permanent facilities -- designed to handle 3.8 million annual passengers -- were someday run at 300% of capacity. 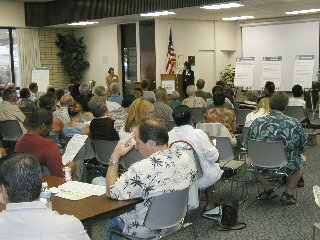 A second public scoping meeting is scheduled for the LB Energy Dept. Auditorium (2400 E. Spring St.) Thurs. Oct. 16 from 6 p.m.-9 p.m.
City Hall is also accepting public input via email (500 words max, no attachments) to "airporteir@longbeach.gov" and is accepted only through the close of business Oct. 23. Comments will also be accepted in writing (esp. for lengthier materials with attachments) through close of business Oct. 22.